Welcome to the IN PLAIN SIGHT Podcast, a podcast to end human trafficking. Each week, we hear from a leader who will inspire you and educate you in your work to end human trafficking around the globe. If you missed our first episode, be sure to listen to Stacia Freeman share about how to work with key stakeholders in your community. 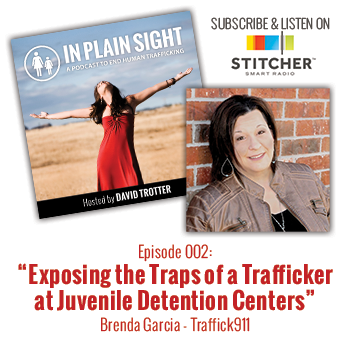 In today’s episode, Brenda shares how Traffick911 has been hosting presentations at 11 detention centers (soon to add three more) over the last three years, which has been recognized by Homeland Security and the FBI. How this presentation is making a difference in the Dallas area. 3-4 critical action steps that you need to take if you were interested in starting something. How to approach a juvenile detention center to develop a similar program.